My Tots Exactly | Pinay Ads |Hott mama in the city | Hot Fun Stuffs | ShysMode | The 24-Hour Mommy | Delight My Appetite | Shengkay’s Journal | Lovedidiverse.com | What’s UP? | Building Carpenters | Cha Ching Queen | WAHMaholic | It’s Not Always About ME | My red hot reviews | Family Life by Fe | The Coupon Cluster | Shengkayful’s Fashion and Lifestyle | Wanna be Fit | Making Time for you | Linda’s Angels | Mommy Coupon Swappers | Fabulicious Diva | Empleyado | CognitifOnce you’ve followed ALL the profiles (separate page to be opened through the Rafflecopter form), leave your Twitter username on the space provided for Extra Info after doing the task so we can verify your entry. On the first mandatory entry, please write Pinay Ads referred you. You must complete the mandatory tasks before the other entries are enabled. 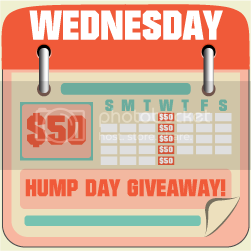 Get a chance to win $50 by following us on Twitter… One day only, open worldwide.